To celebrate the periodic table’s long-running success, the United Nations proclaimed 2019 as the International Year of the Periodic Table of Chemical Elements #IYPT2019. Here at Georgia Tech, our celebration will be all year round #IYPT2019GT! “After evolving for over 200 years through the work of many people, the periodic table remains at the heart of the study of chemistry. 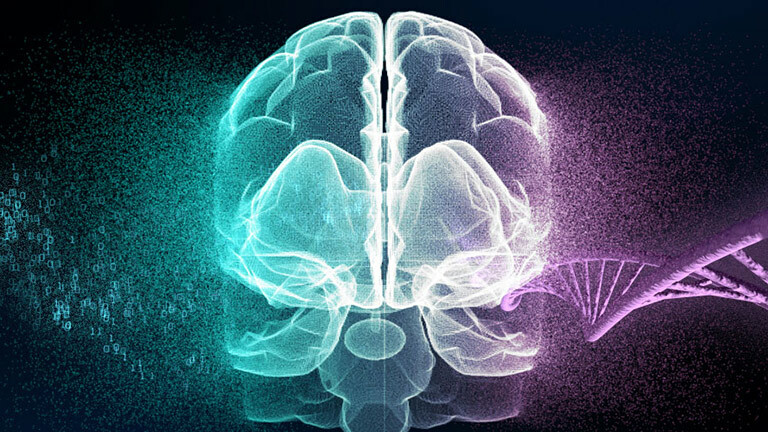 It ranks as one of the most fruitful ideas in modern science, comparable perhaps to Charles Darwin’s theory of evolution. Unlike theories such as Newtonian mechanics, it has not been falsified or revolutionized by modern physics but has adapted and matured while remaining essentially unscathed.” Eric Scerri, “The Evolution of the Periodic System,” Scientific American, Jan. 21, 2011. Led by the College of Sciences, Georgia Tech will celebrate 2019, the International Year of the Periodic Table of Chemical Elements (#IYPT2019GT), all year long. Every week, we will highlight elements through videos and factual trivia. Every month, a student, faculty, or staff will expound on a favorite element in a short video. 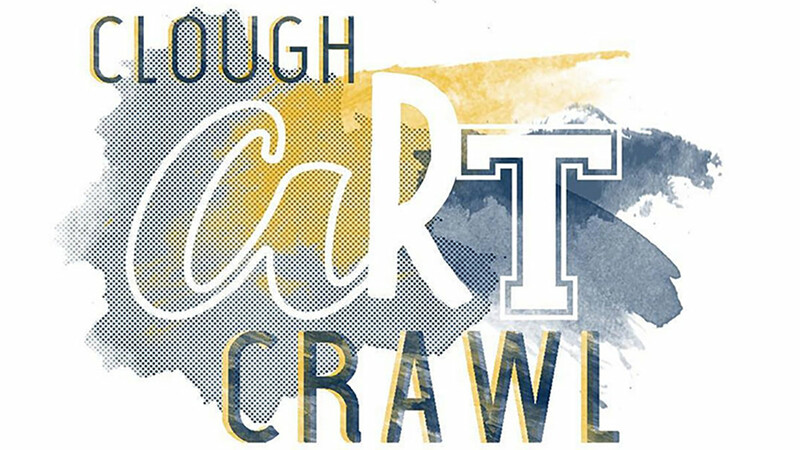 From January to December, we will host events to engage the community with the periodic table through arts, academics, athletics, and fun. Meet new elements. Renew acquaintances with elements you've encountered. With permission from the University of Nottingham's Periodic Table of Videos, we bring you elements at random. Be amused. Be amazed. 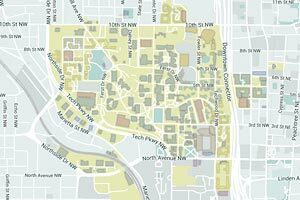 Each month, in our "My Favorite Element" series, meet a Georgia Tech student, faculty, or staff and their favorite element. A unique treat awaited fans at the Yellow Jackets’ Jan. 22 men’s basketball home game. 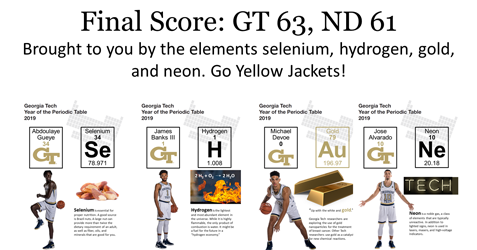 The Georgia Tech team battled Notre Dame’s Fighting Irish for the hoops amid element cards, games, and prizes to celebrate 2019, the International Year of the Periodic Table of Chemical Elements. The Yellow Jackets prevailed over the Fighting Irish, 63-61. #IYPT2019GT is for all of the Georgia Tech community. September 12 Frontiers in Science: The Elusive End of the Periodic Table: Why Chase It?